It's been a while since my last posting... aren't you supposed to say something like that at the start of confession?! Anyway, life changes got in the way. But here you go. Not a bad piece to mark my return to WoodPanels. This was done at a poetry reading last night. 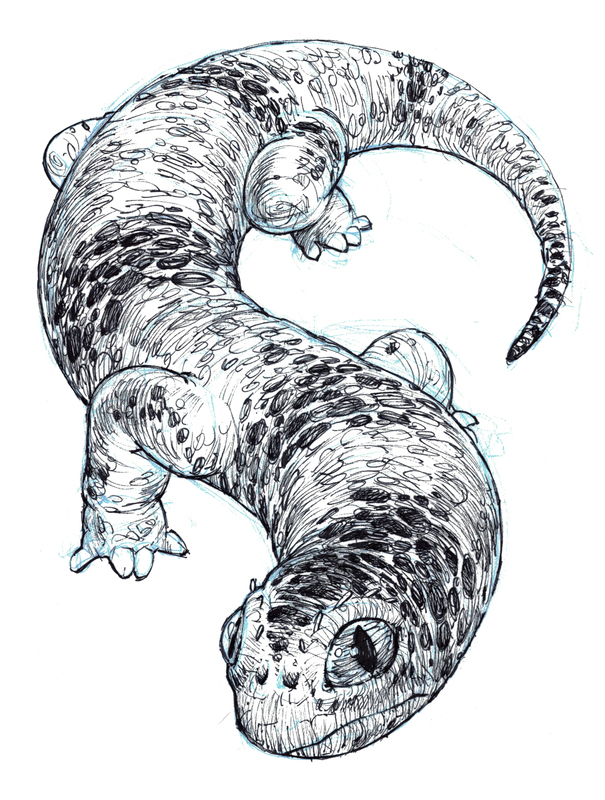 I thought of filling a page with various lizards, but the idea or image in my head wasn't at all like this result. When I did the blue pencil sketch which filled the page pretty well, I forgot about doing a bunch of drawings and focused on this one. It took about an hour and a half, but as you might expect most of the time was spent shading. What do I like about this one? I like pose, the "s" shape. Very sinuous and smooth. I like how you can see the form of the creature - it's roundness which is well described by the fine lines. I like the eyes, which I think are pretty convincing, especially the one on the left, how you can see through the cornea and see just the edge of the iris and pupil. I like the creature's proportions and anatomy - the extra long neck and his funny mouth that isn't happy or sad or any one thing. I like the different tonal bands that were done by shading some scales/ovals darker as opposed to drawing bands or rings around the body and then shading the whole section. That wouldn't have looked so subtle. I like the tiny horns for eyebrows, which, incidentally, are pretty much the only thing that came from my original mental image into the final piece. The only thing I think would have made this one better would have been a bit of a shadow underneath the lizard, to place him on a ground plane. Other than that, not bad. Thanks, Mr. I. Ghost for mentioning WoodPanels and my absence from it. I have been away from it too long and your words encouraged me to get back to it. I hope to post more and perhaps something more comic/sequential art related.